Our 4th annual KNIME Fall Summit is taking place from November 5-8, 2019 in Austin, Texas. Join us, along with top data scientists and industry thought leaders, for four days of learning more about KNIME Software and how it's being used to solve complex data problems in areas such as life sciences, manufacturing, marketing, retail sales, and more. Meet the people behind KNIME and hear about new and upcoming features, as well as discuss all things data science and data analytics with other KNIME users and enthusiasts. 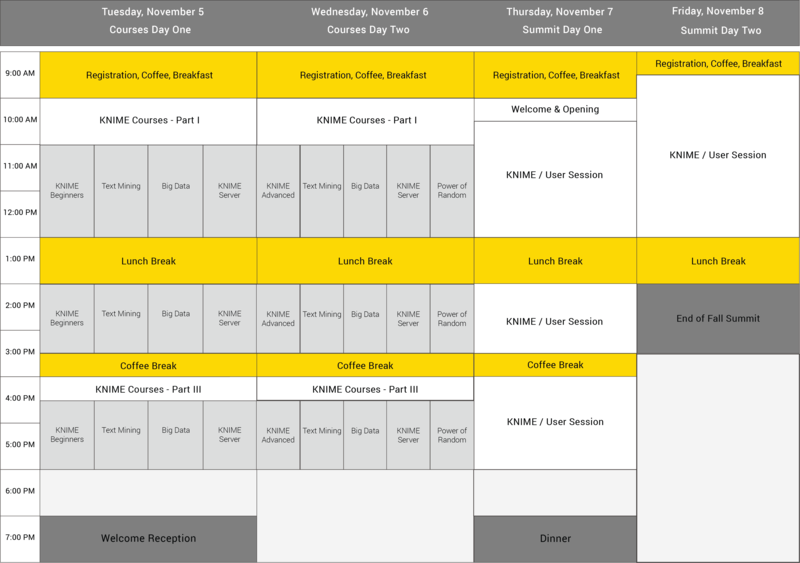 On November 5 & 6 we are offering several one-day KNIME courses that cover a variety of topics. Your summit registration allows you to select either one or two of these full day courses. More courses will be added over time. The Power of Random: Using Perturbation Experiments to Improve Model Accuracy and Interpretation. Presented by Dean Abbott, SmarterHQ.